Got the first of many new video podcasts from Amsterdam up in iTunes and on the IT&T SIG Vimeo site. These were both shot at the 2009 EMEA Congress in Amsterdam. What I posted today were the videos of IT&T SIG Regional Director Jose Angelo da Costa Pinto interviewing PMI Chair Ricardo Vargas. We've got one interview in English and another in Portuguese. Earlier in the week I posted a link to Ricardo's podcast on Scrum. He was a presenter at the 2009 Latin America Scrum Gathering a few days before the PMI Congress in Amsterdam. Ricardo is an amazing guy and he is very enthusiastic about the efforts being made by the IT&T SIG, PMI and the Scrum Alliance to help build a bridge between the Scrum/Agile community and the PMI community. Also, for those of you who haven't been following Bas's posts about social media, here is a link to one of his recent posts -> ProjectShrink. Bas gave a great talk on using social media at the PMI Congress in Amsterdam. I hope to post them within the next few days before heading to Lisbon to speak at the PMI Portugal 4th Annual Project Management Conference. I am really looking forward to the event in Lisbon. It should be very cool. My summary and videos from PMI Leadership and Congress in Amsterdam last week should be up within a day or so. In the meantime, PMI Chair, Ricardo Vargas has a new website and has posted a podcast on Scrum and Agile. Ricardo spoke at the Scrum Gathering in Latin America just over a week ago before making the trip to Amsterdam for PMI Congress. His level of enthusiasm for building the bridge between traditional Project Management and the Agile world is a wonderful thing. Day Two of the 2009 PMI EMEA Global Congress. After tweeting almost the entire time at PMI’s Leadership Institute Meeting we started at the Global Congress yesterday. Unfortunately the service is weak and expensive, so I’ve fallen behind in my posts. The most significant event at PMI’s GC this year (IMHO) was the Agile Pecha Kucha sessions. This has been a long time coming and I hope we see a lot more of it. For those who are unfamiliar, the format is 20 slides, 20 seconds per slide. So, rather than watching someone read slides to you for 60 minutes. He now get to watch a much more vibrant presentation in 6:40 seconds. The style also focuses heavily on slides featuring large images or small amount of tax. The lightweight slide format forces the presenter to carry the show instead of the other way around. This is an alternative that has been greatly needed for some time at PMI Congress and Leadership events. With each of the presentations focusing on Agile it made the sessions even more cutting edge. While Agile is certainly not new in the technology space it still represents an innovative approach for the traditional project management crowd. There were four agile sessions over all during Global Congress. Each of them was well attended and the information presented was well received. The last agile session of the Congress was a roundtable discussion featuring Juliette Andrew from EMC, Mattias Petrén from Leadway and PMI Sweden, Excella Consultant and PMI Agile Forum Founder, Jesse Fewell and myself with Bob Tarne, IT&T SIG VP of PR and former Chair as moderator. We had a great crowd with some lively discussion. There is a definite spark within the PMI Community that is picking up on Agile as an important way of adding to the toolset that enables you to solve project problems. There is a lot more to tell, but I have to head downstairs for the Taste of Holland reception. It is Day 3 of the PMI LIM. Rather than blogging each day, I've been tweeting under @pmiittelecom and @mrsungo. Sessions have been good and I will post a wrap up later. This is a big deal for me because I've been trying to post video from LIM/Congress for the past two years and this is the first time I've been able to get anything live from the event. The Agile folks who will be presenting during the Pecha Kucha sessions will arrive today and I'm looking forward to getting to hang out with them this evening. Also, Frank Blome (Project Wizard's Merlin - http://projectwizards.net/en/) will be arriving today, can't wait to see him again. Tomorrow I am hoping to meet up with (and interview) Bas de Baar. Bas is the creator of ProjectShrink http://blog.softwareprojects.org/. If you are a PM and aren't reading his blog, you need to start. I'll be tweeting from PMI meetings in Amsterdam under @pmiittelecom and using #pmi beginning later today. Blog posts and video podcast interviews will also be forthcoming. 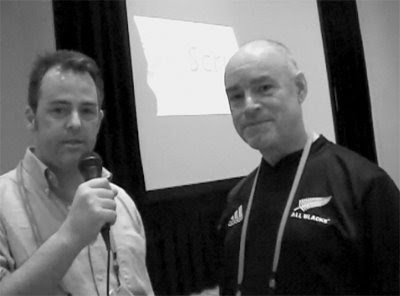 One of my favorite parts of the Scrum Gathering in Orlando this Spring was getting to spend a few minutes talking with Ken Schwaber about Scrum, PMI and "Scrum, but..."
Next stop, Amsterdam! Look for blog postings, tweets and video interviews from the PMI EMEA Leadership Meetings and Congress. I'm especially psyched to see what happens when PMI takes on Pecha Kucha... should be quite the mashup.